Finally, a truck that’s INTENDED to have the monster wheels. lol yeah, i wonder what the turning radius on it is..
Didn’t even think of that lee7, it’s probably about 20 feet (although I’m really not sure sure about turning radius’s) Isn’t it the widest u turn? Lol 20 feet is very tight turning radius. It MIGHT be 20 yards, probably more than that on that hoss. 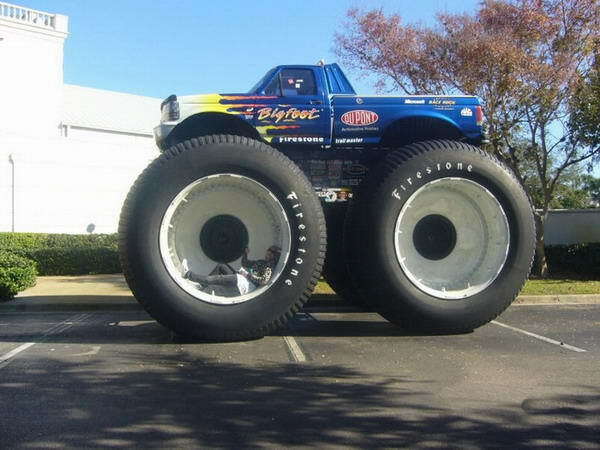 I beleive that’s Bigfoot 5, there were like 10 of them back in the day when i was a kid and watched monster truck stuff. one was on modified tank tracks. I’ll bet it has the turning radius of a school bus. Factoid 1: Did anyone even notice there was someone in the wheel laying there? Factoid 2: Did you know that Monster Trucks can drive on water? There’s so much air in the tires, that they just glide over it as if it were nothing.